Department of Geology, Miami University, Oxford, Ohio 45056, U.S.A.
California Institute of Technology, Pasadena, California 91125-2500, U.S.A.
Mount Holyoke College, South Hadley, Massachusetts 01775, U.S.A. The dark blue rim of black schorl-olenite from an abyssal pegmatite at the Kuklík locality near Kutná Hora, Czech Republic has been chemically and structurally characterized. The optimized formula, calculated using chemical and structural data, is X(Na0.54Ca0.10K0.010.35) Y(Al2.11Fe2+0.78Mn2+0.06Ti4+0.010.04) Z(Al5.90Mg0.10) T(Si5.49Al0.51) B3 O27 [(OH)2.80O1.19F0.01], with a = 15.8838(3), c = 7.1056(2) Å, R = 0.017. The relatively small <Y-O> bond-length with 1.992 Å confirms the high content of Al at the Y site (~2.1 apfu). It is similar to that of olenite from the type locality; in contrast the olenite from Kuklík contains significant amounts of Fe at the Y site, and significant amounts of Al (~0.5 apfu) instead of B in the T site. This is supported by the crystal structure showing an enlarged <T-O> bond-length of ~1.626 Å. This olenite shows that it is not necessary to have B in Al-rich tourmaline. The (OH) content with ~2.8 (OH) pfu, which was calculated for a charge balanced formula, is lower than the usual 3 (OH) at the O3 site of most tourmaline samples. An (OH) content <3.0 pfu at the O3 site was also verified by the relationship between the bond-angle distortion (sigmaoct2) of the ZO6 octahedron and the <Y-O> distance. 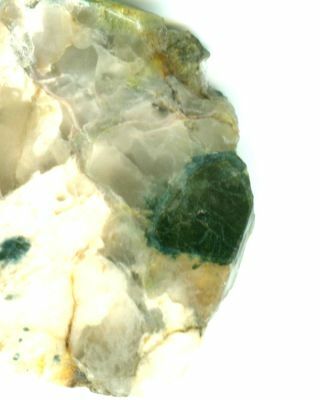 The olenite from Kuklík most probably lies between the tourmalines, which contain 3 (OH) at the O3 site, and natural buergerite, which contains 0.3 (OH) and 2.7 O at the O3 site. Therefore, the composition of this olenite shows a trend towards the proposed olenite end-member formula, which contains only 1 OH group. 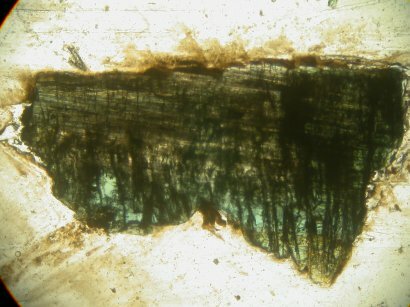 The low content of F (0.01 apfu) is uncommon for a natural Al-rich and Mg-poor tourmaline from granitic pegmatites. Optical absorption spectra indicate that Fe is mainly present as Fe2+, with a minor content of Fe3+. Edge of the olenite crystal. Scale: 2.7 mm left to right, 0.18 mm thick. The c-axis runs left to right.